This section provides information about using Spark SQL. Using SQLContext, Apache Spark SQL can read data directly from the file system. This is useful when the data you are trying to analyze does not reside in Apache Hive (for example, JSON files stored in HDFS). 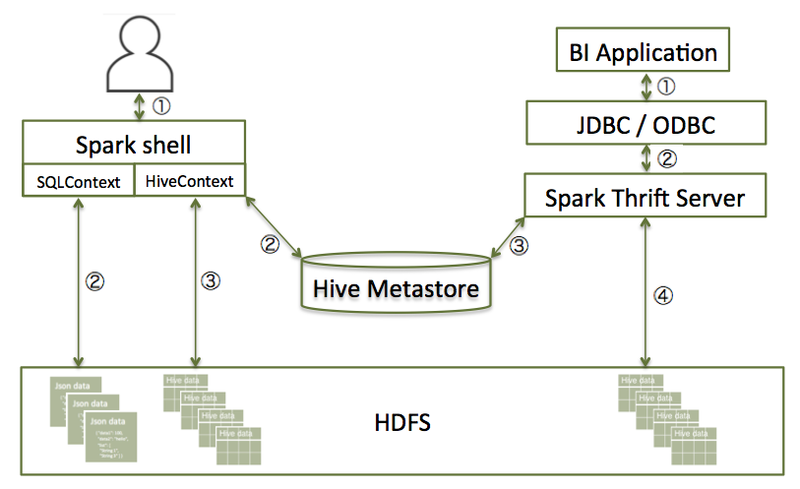 Using HiveContext, Spark SQL can also read data by interacting with the Hive MetaStore. If you already use Hive, you should use HiveContext; it supports all Hive data formats and user-defined functions (UDFs), and it enables you to have full access to the HiveQL parser. HiveContext extends SQLContext, so HiveContext supports all SQLContext functionality. Interactive access using the Spark shell (see "Accessing Spark SQL through the Spark Shell" in this guide). For more information about JDBC and ODBC access, see "Accessing Spark SQL through JDBC: Prerequisites" and "Accessing Spark SQL through JDBC and ODBC" in this guide. The following subsections describe how to access Spark SQL through the Spark shell, and through JDBC and ODBC. Use the following steps to access Spark SQL through JDBC. Use the following steps to access Spark SQL through ODBC.